It is with great sadness and shock that I have to report that Doug Switz, (FanofBats on the forums, and the man behind Insane Detailing) passed away on February 15, 2013. Doug was an amazing craftsman, a gentle, caring soul and a good friend. His sister Jennifer just emailed me that Doug was walking and collapsed. The doctors reported “natural causes”. He was a massive Bat-Fan, and a great asset to our hobby and community. He contributed much to what Pimp My Batmobile offered in the past few years. He will be missed. I will post a more thorough eulogy here once I have the chance to process this and find some of Doug’s amazing work and words to feature. Round 2 Deluxe 1966 1:25 Batmobile Kit Has Arrived! Scot thanks for the post on Eric’s site. It’s difficult to process the why’s and wherefores of God’s master plan. One must wonder why someone so good at being a friend, must be taken away at such a young age. Last night was the first night in weeks I slept without physical pain. My heart however, wept the night through. Doug was our friend. Above being a fellow fan boy, beyond his exceptional talents, he was a great friend. Selfish. This is not a word that could ever be applied to Doug by anyone who knew him for more than ten minutes. However, we are all selfish. That is why we grieve. We want our friend back, and that is so very selfish of us, because he has moved on to the next phase of life. The everlasting. We should not mourn or wail at our loss, but should celebrate the life of the man we knew, and take heart in that when we arrive at those gates ourselves, there will be a friendly face to greet us. Doug was more than a friend. He was family, and I miss him. I didn’t know him personally, but purchased a few of the crazy accurate miniature parts he created for my 1/18 Batmobile. At least I’ll have those to remember him by, and I will smile when I enjoy them. I regret that I never drove down to Aliso Viejo to shake his hand and maybe spend an afternoon talking modeling, Batmobiles, the Lone Ranger, and George Reeves’ portrayal of Superman. I do take solace in the help and companionship Doug gave me via e-mail. 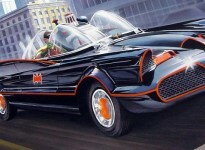 He will be remembered every time I look at my Batmobiles and Black Beauty. I am saddened by this news, I am so sorry to hear this about Doug. He wa s a big help to me in Completing my Upgrade to my 1:18 Scale Batmobile. I was able to get some real nice parts from him just about 4 months ago. Doug and I gave ourselves the nicknames Gilligan and Skipper. He being large and me being well……you know. So Skipper there have been a lot of laughs and hopefully we be given a better script next time. He once prayed with me over the phone and he blessed me like a brother who knew me well. Model parts that i have… i will always remember you Doug when i look at the bat parts on my 1/18 Batmobile. Really sorry to hear about the loss of Doug…I know the last few years were not kind to him…I would usually see at the Porsche Literature show at the LA Airport Hilton and he was always fun to chat with and an absolute fountain of knowledge…especially in regards to Mark Donohue and the Porsche 917/30!….bought a ton of cool stuff from him and would usually contact me if he had something special-we would always work a deal- one way or the other…he will be missed by many.